South african born building contractor Kez Taylor has been based in Dubai for 15 years. Kez and his wife fell in love with the Seychelles 22 years ago and bought a villa on Eden Island recently. My wife and I bought the Eden Island villa in Seychelles two years ago. It’s fantastically designed and in a stunning location. We are very happy with the property, both as end users and investors. Eden Island properties have a distinctly Seychellois design. The properties are well-appointed and immaculately maintained. They are a great option for holidaymakers seeking comfortable, elegant accommodation with excellent amenities or people like us, who wanted to own a little bit of paradise. Eden Island has been developed incredibly well. It’s close to the airport, in fact you can get there in five or ten minutes, which really makes a difference if you want to relax. The property is also adjacent to the Sainte Anne Marine National Park, which is stunning and has fabulous marine life. We love the Seychelles, it’s beautiful, easy to get to. My wife and I came here on our honeymoon 22 years ago and we fell in love with the place. Our villa is 4,500 sq ft and has four bedrooms and four bathrooms with a large open plan lounge, dining room and kitchen. 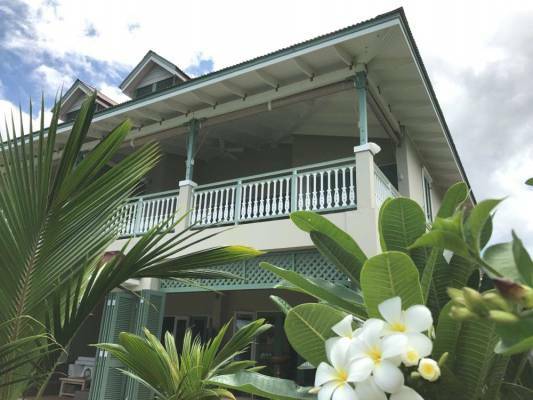 The house boasts large verandas and open rooms with immaculate views of the ocean, mountains, forests, and other nearby islands with convenient access to moorings. We furnished the whole place from stores in Duba: Natuzzi, Rattan house, Luz De Luna, Pottery barn, Bloomingdales. These are all favourites that we have used with both our homes. All of it was sent over in a container and it really allows us to express our personal style. We have a coral reef right in front of the door and can go snorkelling every day, seeing turtles and tropical fish. We don’t have one, but super yacht owners can also find berths for their vessels up to 100m in length in the international deep-water marina situated on the development. Our villa has a perfect ocean view looking over the marine park and that was one of the deciding factors when we bought it. To have a coral right off the porch is a real treat. We have made quite a few changes to the interior and exterior though. Our neighbours have darker wood trusses. We painted ours white and love the light effect. We like the clean minimal look in the bedrooms, especially in our holiday home. Our Dubai house is a bit more cluttered so it’s nice to keep this place simple and perfect for relaxing. In terms of the décor, we have gone for a neutral and natural look. The dining table is natural timber . That is just our style. We had great fun decorating and we are thrilled with the results.